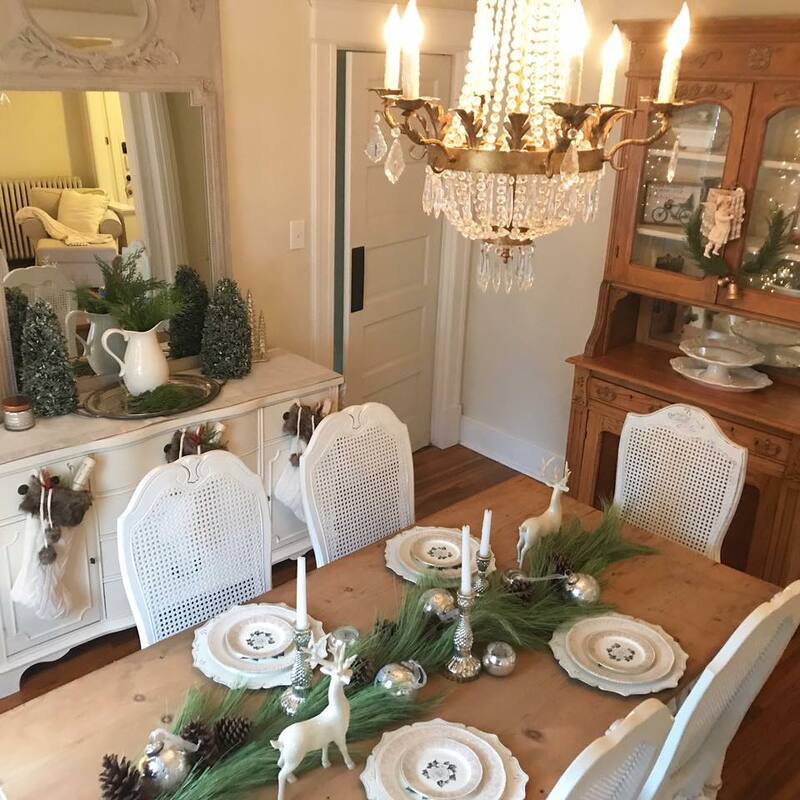 Even though Nichole of Corner French Cottage is just gearing up for this year’s Christmas decorating, the talented designer of French country interiors invited us to merrily tour her charming white home’s Christmas past. Beautiful French Country Christmas Decorating Inspiration awaits! 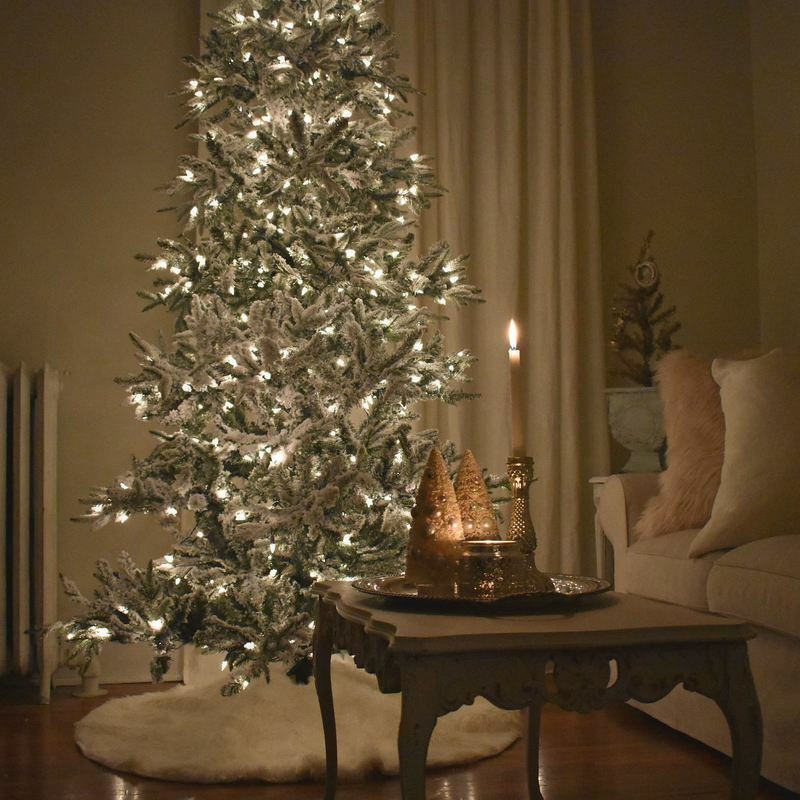 Cozy living room with flocked Christmas tree. Photo/Design: Corner French Cottage. 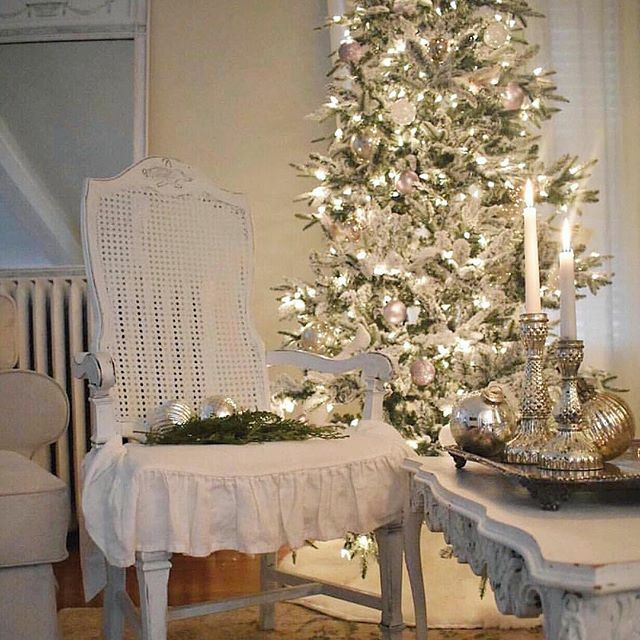 French Country Christmas Decorating Inspiration. Romantic Provence inspired interiors with elegant shabby chic charm. House tour of a charming French cottage…certainly lovely indeed! Holiday decor ideas and vintage style to inspire your own decking of the halls. 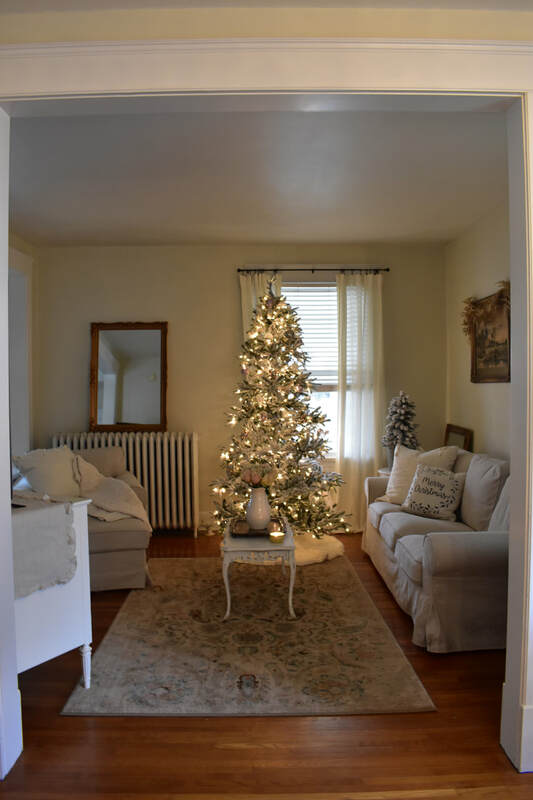 If you love white on white decor, shabby chic simplicity, and French country goodness, I do believe these cozy moments of vintage and holiday happiness will tug at your heartstrings. 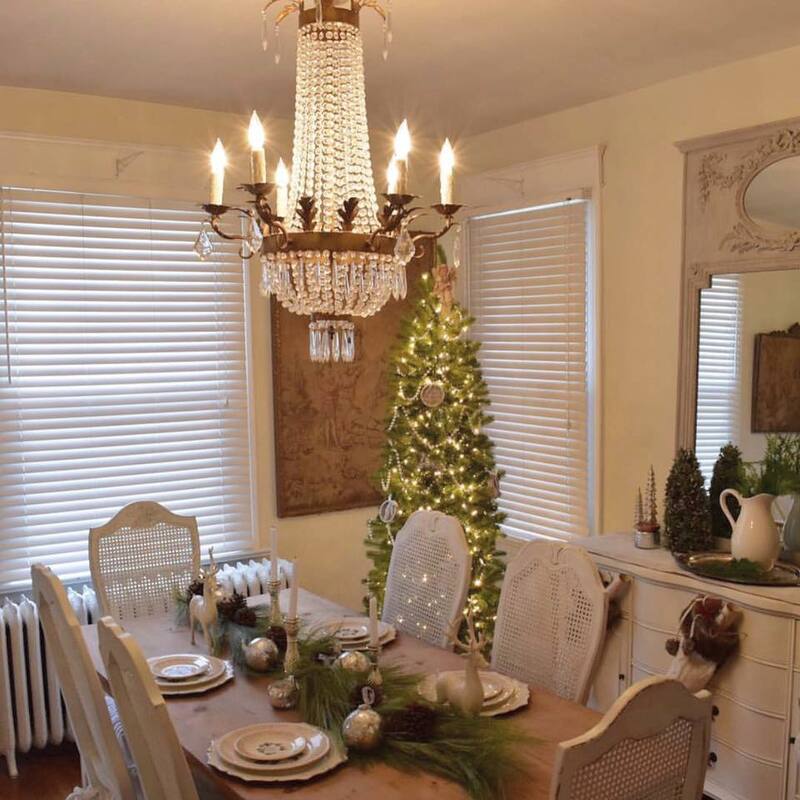 In fact, this Illinois home’s tour has inspired me with all sorts of gorgeous ideas for holiday decor since the vignettes stay airy and fresh (as opposed to getting stuck in granny-land if you know what I mean). I wonder if being a young mom of a toddler gives Nichole a decorating advantage? 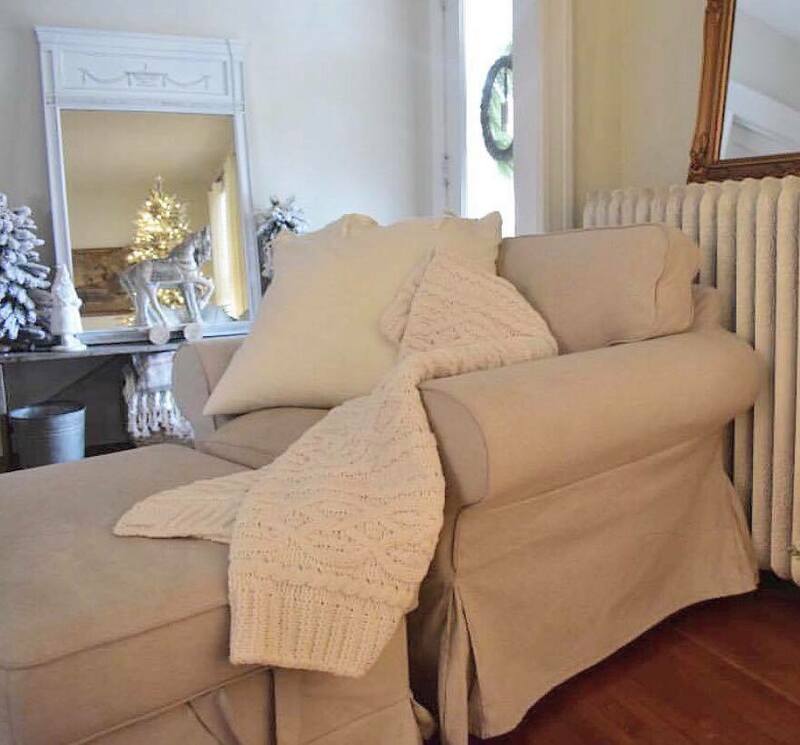 Let’s get to know Corner French Cottage! What do you love about French country design? 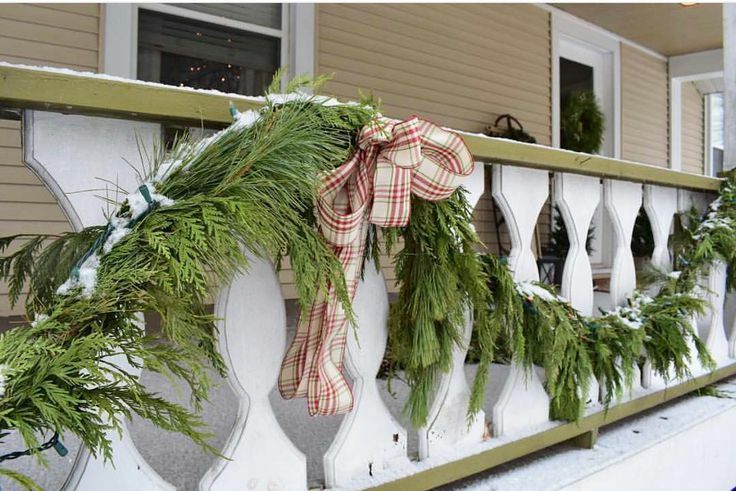 Fresh garlands decorate a charming front porch railing. Photo/Design: Corner French Cottage. French Country Christmas Decorating Inspiration. Need festive plaid ribbon for your decor? SEE THESE OPTIONS. Romantic Provence inspired interiors with elegant shabby chic charm. House tour of a charming French cottage…certainly lovely indeed! Holiday decor ideas and vintage style to inspire your own decking of the halls. 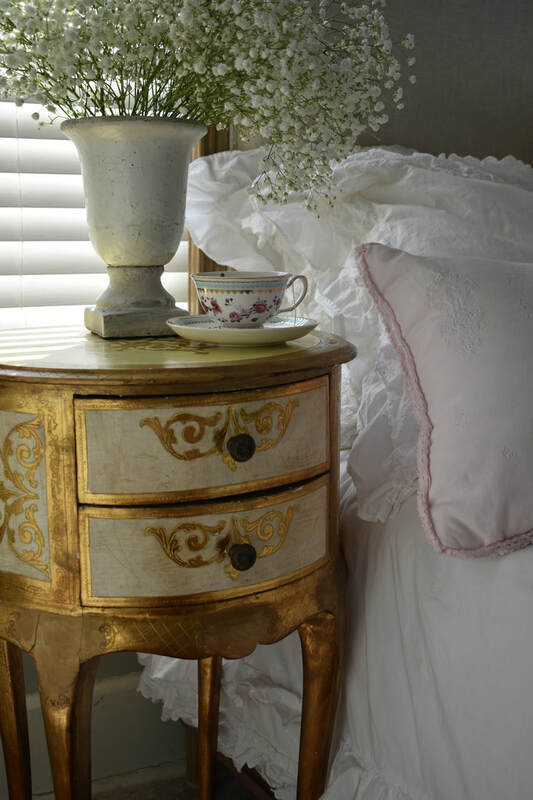 Floretine side tables and feminine bedding in a lovely French cottage bedroom. Photo/Design: Corner French Cottage. French Country Christmas Decorating Inspiration. Is a vintage Italian Florentine table calling your name? FIND OPTIONS HERE. Romantic Provence inspired interiors with elegant shabby chic charm. House tour of a charming French cottage…certainly lovely indeed! Holiday decor ideas and vintage style to inspire your own decking of the halls. See vintage crystal candelabra options RIGHT HERE. Serene and spare, the dining room’s rustic table contrasts sweetly with vintage cane backed dining chairs. Photo/Design: Corner French Cottage. 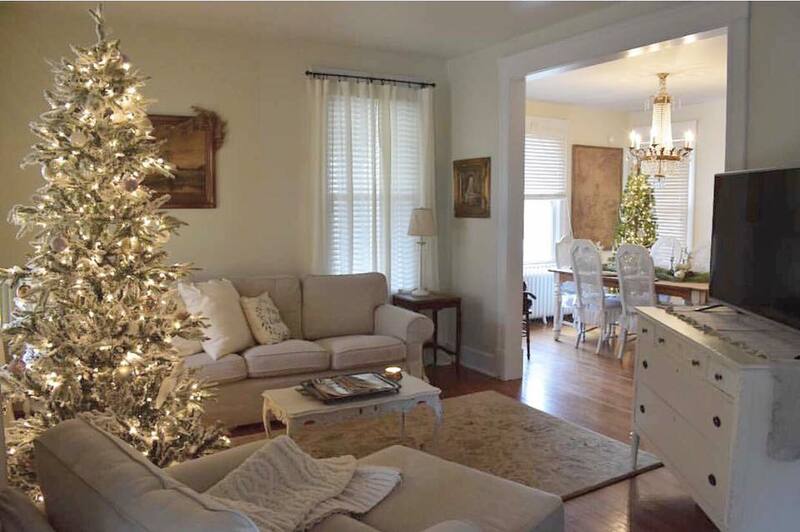 French Country Christmas Decorating Inspiration. Romantic Provence inspired interiors with elegant shabby chic charm. House tour of a charming French cottage…certainly lovely indeed! Holiday decor ideas and vintage style to inspire your own decking of the halls. FIND EMPIRE CHANDELIER OPTIONS RIGHT HERE. 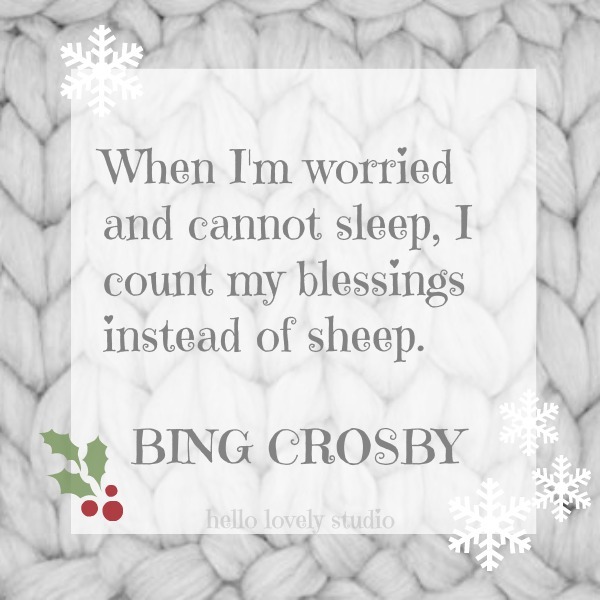 Bing Crosby quote. When I’m worried and cannot sleep, I count my blessings instead of sheep. What catches your eye at the flea market? A flirty skirt on an arm chair, mercury glass, and white on white splendor for Christmas! Photo/Design: Corner French Cottage. French Country Christmas Decorating Inspiration. Romantic Provence inspired interiors with elegant shabby chic charm. House tour of a charming French cottage…certainly lovely indeed! Holiday decor ideas and vintage style to inspire your own decking of the halls. FIND FLOCKED CHRISTMAS TREE OPTIONS HERE. Lovely Mirrors Reflecting More Lovely! 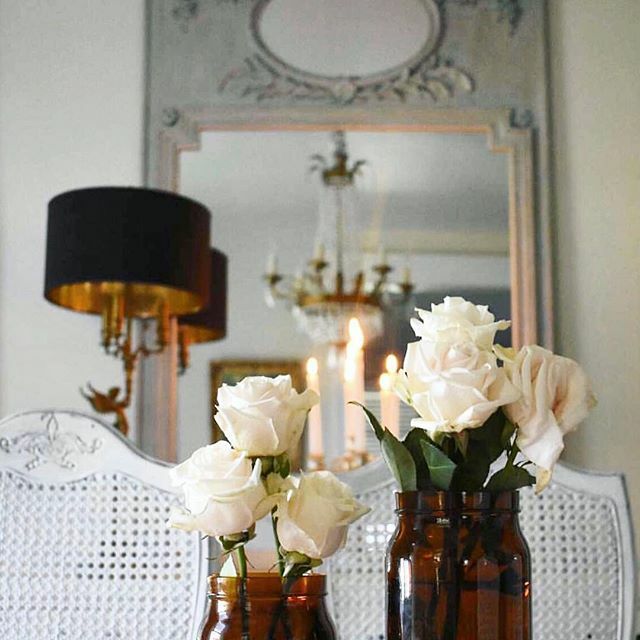 White roses are always a good idea, and we don’t often see them in brown glass! Photo/Design: Corner French Cottage. House tour of a charming French cottage…certainly lovely indeed! Shabby chic, French cottage decor ideas and vintage style to inspire your own decor dreams. 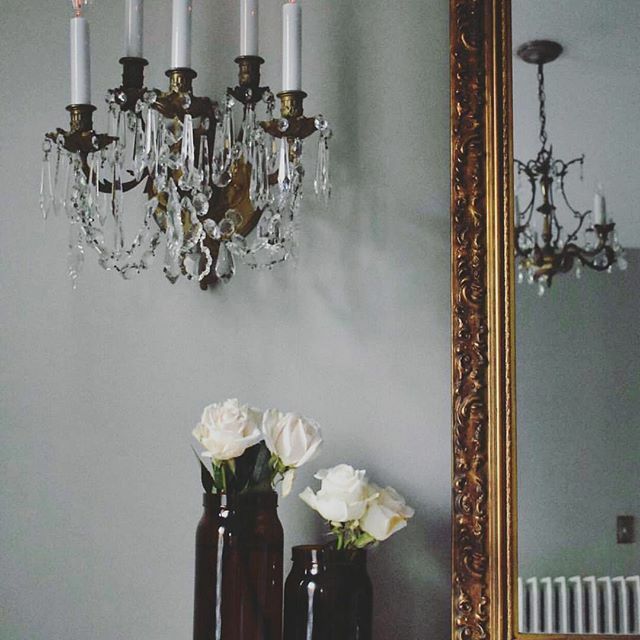 Vintage chandeliers and sconces dripping with sparkly crystals, anyone? Photo/Design: Corner French Cottage. House tour of a charming French cottage…certainly lovely indeed! Shabby chic, French cottage decor ideas and vintage style to inspire your own decor dreams. 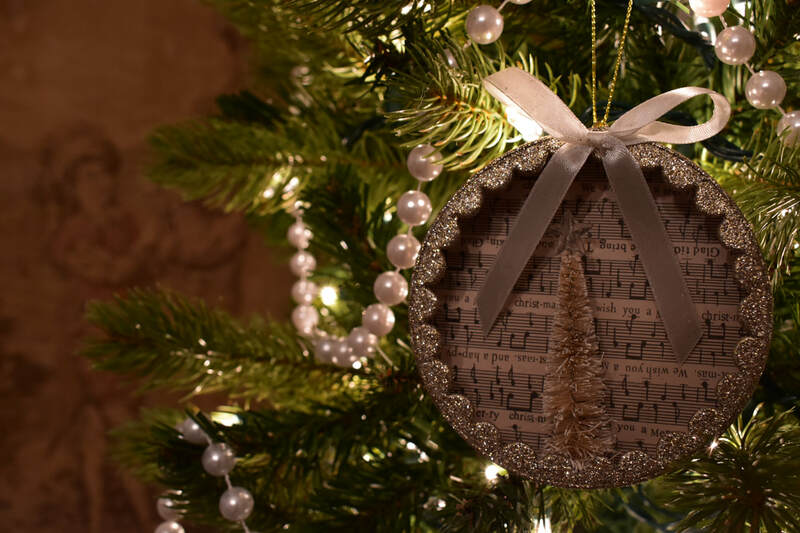 Detail of a gorgeous Christmas ornament on the tree. Photo/Design: Corner French Cottage. French Country Christmas Decorating Inspiration. Romantic Provence inspired interiors with elegant shabby chic charm. House tour of a charming French cottage…certainly lovely indeed! Holiday decor ideas and vintage style to inspire your own decking of the halls. A cozy von cozy living area with a hushed palette and mood. Photo/Design: Corner French Cottage. French Country Christmas Decorating Inspiration. Romantic Provence inspired interiors with elegant shabby chic charm. House tour of a charming French cottage…certainly lovely indeed! Holiday decor ideas and vintage style to inspire your own decking of the halls. FIND FLOCKED CHRISTMAS TREE OPTIONS HERE. 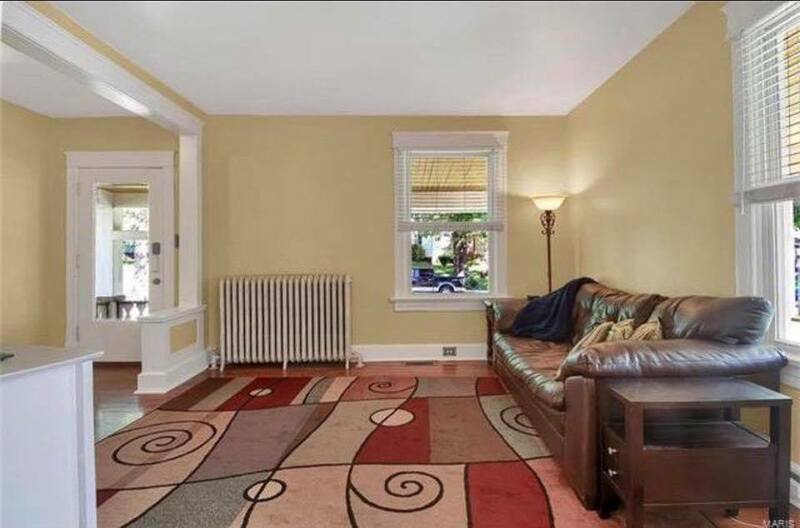 The room above didn’t always look so inviting…check out the before below. uote from Buddy the Elf. 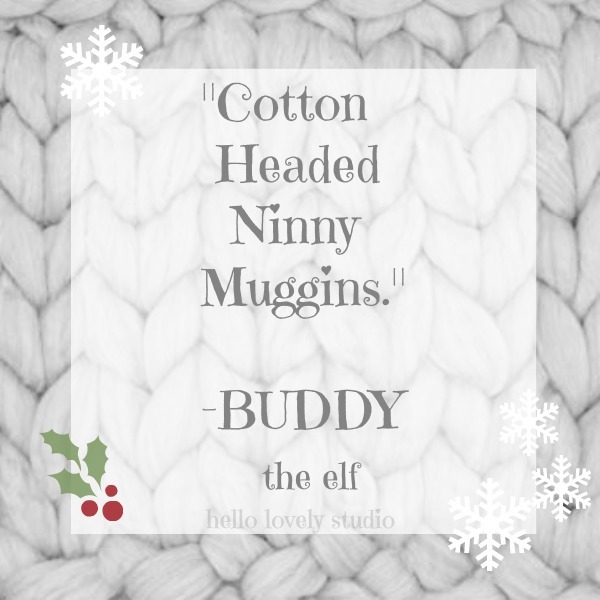 Cotton Headed Ninny Muggins. Vintage style is timeless and lovely. Photo/Design: Corner French Cottage. House tour of a charming French cottage…certainly lovely indeed!Shabby chic, French cottage decor ideas and vintage style to inspire your own decor dreams. Is a vintage Italian Florentine table calling your name? Tell us about your approach to decorating for Christmas. 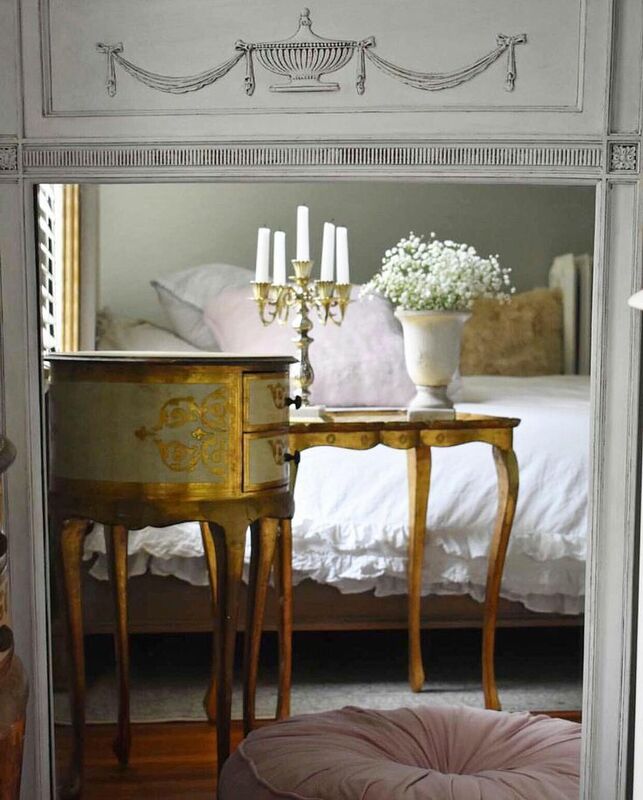 A pretty bedroom of which Marie Antoinette would approve. Photo/Design: Corner French Cottage. House tour of a charming French cottage…certainly lovely indeed! Shabby chic, French cottage decor ideas and vintage style to inspire your own decor dreams. Is a vintage Italian Florentine table calling your name? FIND OPTIONS HERE. 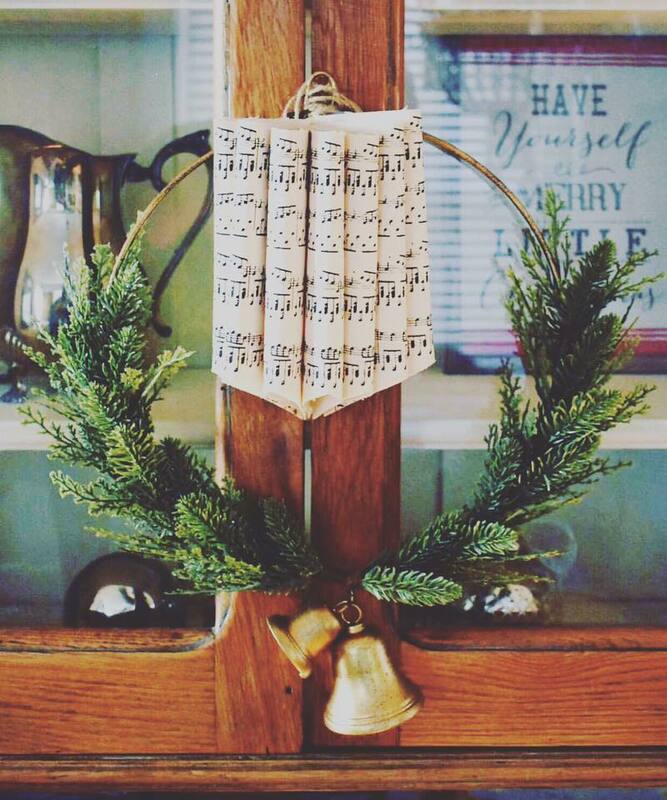 Charming holiday wreath with sheet music and bells. Photo/Design: Corner French Cottage. French Country Christmas Decorating Inspiration. Romantic Provence inspired interiors with elegant shabby chic charm. House tour of a charming French cottage…certainly lovely indeed! Holiday decor ideas and vintage style to inspire your own decking of the halls. 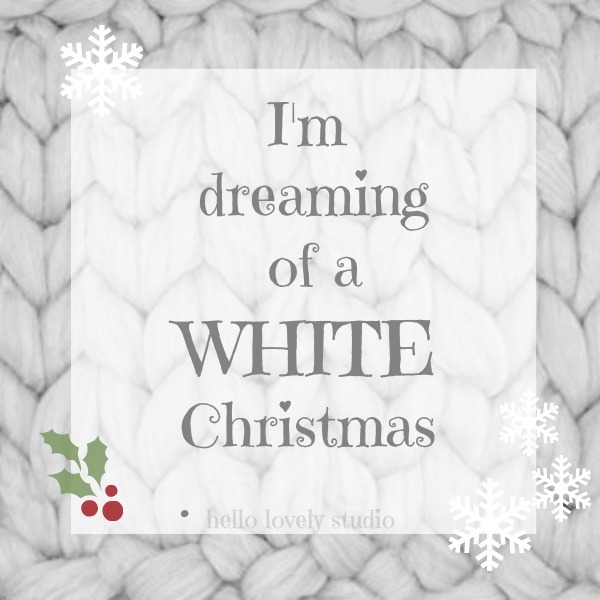 White Christmas quote. 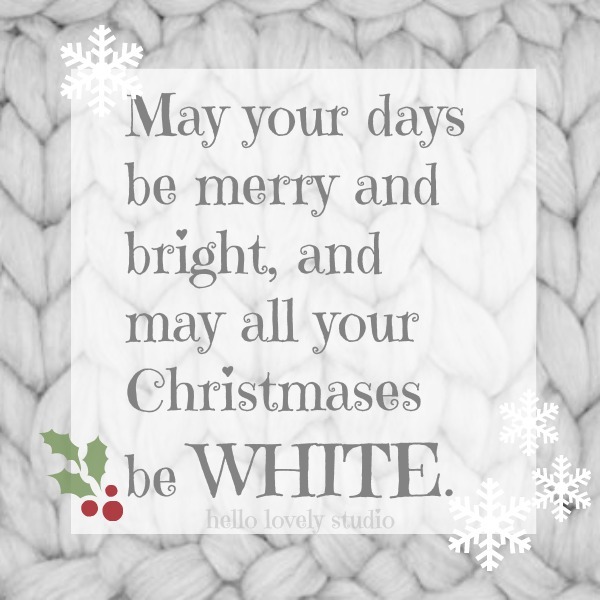 May your days be merry and bright, and may all your Christmases be WHITE. 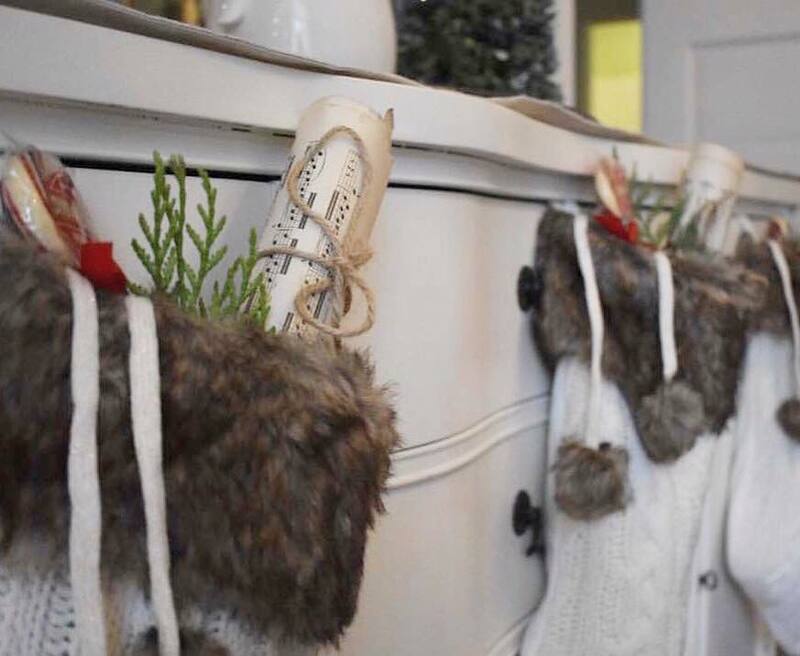 Fuzzy wuzzy trimmed knit Christmas stockings hung by the sideboard with care. Photo/Design: Corner French Cottage. French Country Christmas Decorating Inspiration. Romantic Provence inspired interiors with elegant shabby chic charm. House tour of a charming French cottage…certainly lovely indeed! Holiday decor ideas and vintage style to inspire your own decking of the halls. 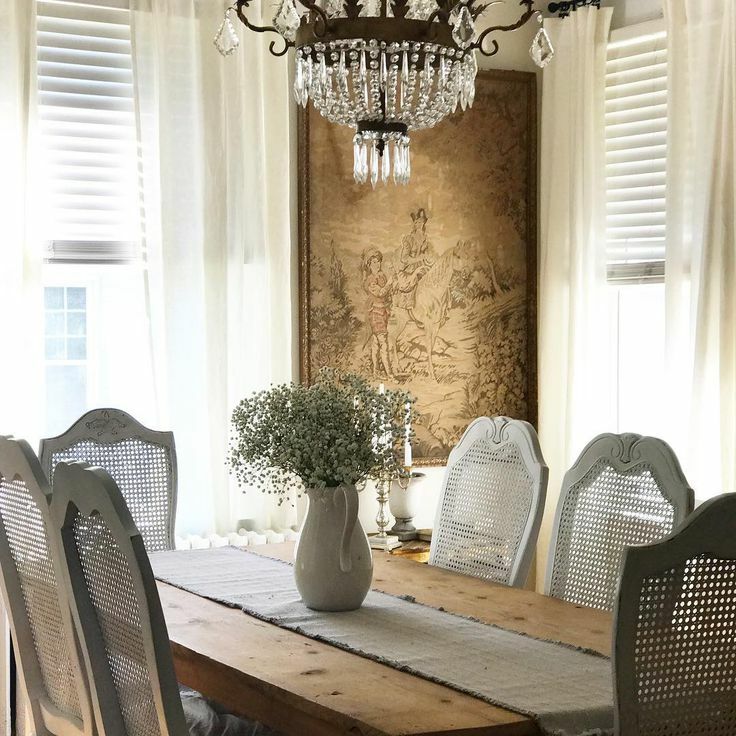 An empire chandelier twinkles above a naturally simple chic tablescape below in the dining room. Photo/Design: Corner French Cottage. French Country Christmas Decorating Inspiration. Romantic Provence inspired interiors with elegant shabby chic charm. House tour of a charming French cottage…certainly lovely indeed! Holiday decor ideas and vintage style to inspire your own decking of the halls. 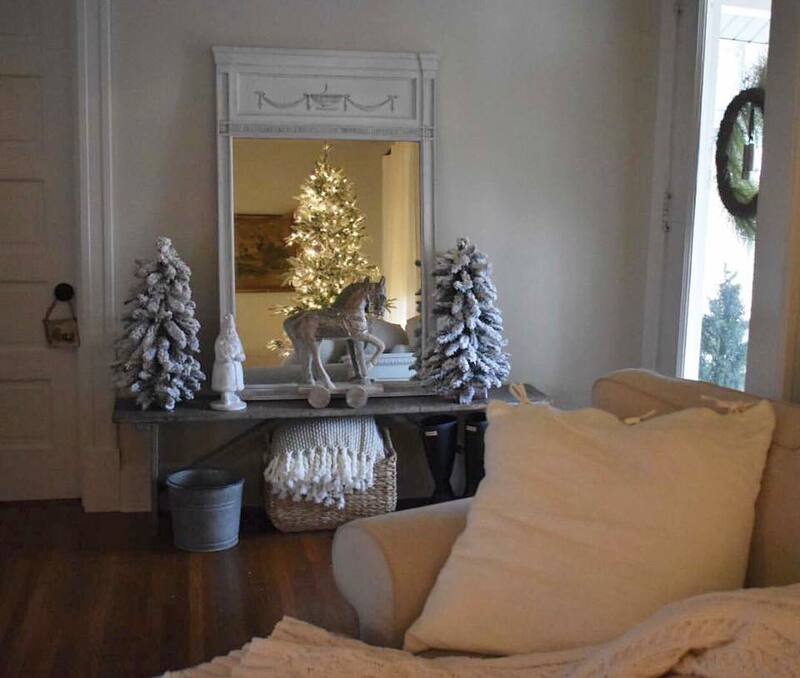 A rustic console table is perfect for layering on white Christmas trees and decor. Photo/Design: Corner French Cottage. French Country Christmas Decorating Inspiration. Romantic Provence inspired interiors with elegant shabby chic charm. House tour of a charming French cottage…certainly lovely indeed! Holiday decor ideas and vintage style to inspire your own decking of the halls. White Christmas lyrics. 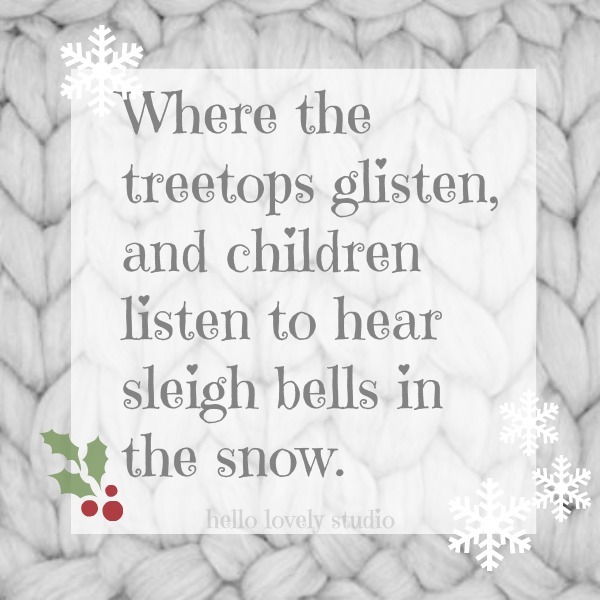 Where the treetops glisten, and children listen to hear sleigh bells in the snow. Fresh greenery, pinecones, silvery spheres, and white deer adorn a charming dining table. Photo/Design: Corner French Cottage. 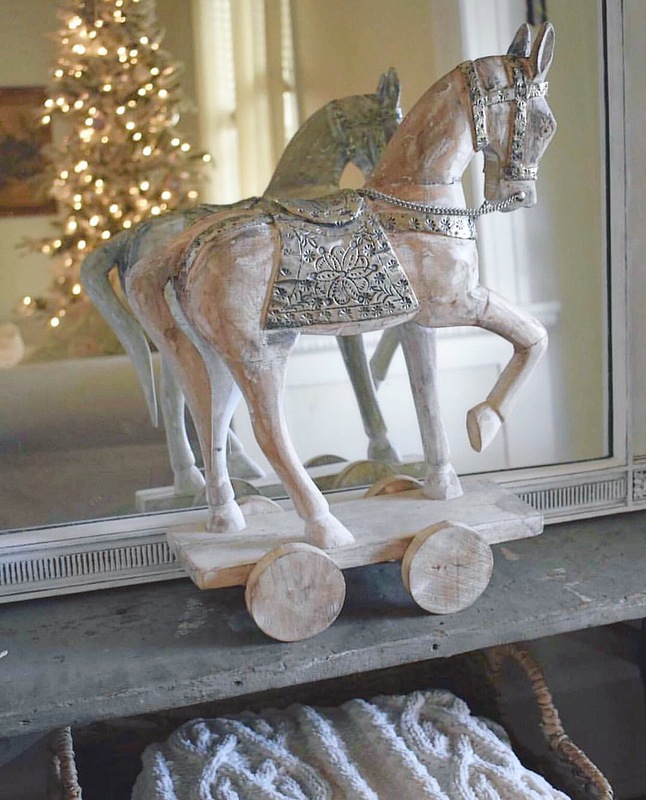 French Country Christmas Decorating Inspiration. . Romantic Provence inspired interiors with elegant shabby chic charm. House tour of a charming French cottage…certainly lovely indeed! Holiday decor ideas and vintage style to inspire your own decking of the halls. Comfy slipcovered furniture for snuggling. Photo/Design: Corner French Cottage. French Country Christmas Decorating Inspiration. Romantic Provence inspired interiors with elegant shabby chic charm. House tour of a charming French cottage…certainly lovely indeed! Holiday decor ideas and vintage style to inspire your own decking of the halls. In case you needed another idea for repurposing a vintage dresser! Photo/Design: Corner French Cottage. French Country Christmas Decorating Inspiration. Romantic Provence inspired interiors with elegant shabby chic charm. House tour of a charming French cottage…certainly lovely indeed! Holiday decor ideas and vintage style to inspire your own decking of the halls. 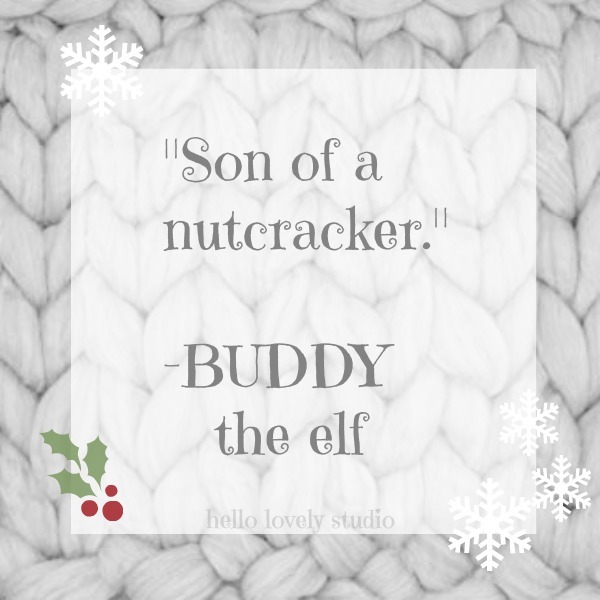 Son of a nutcracker…quote from Buddy the elf. 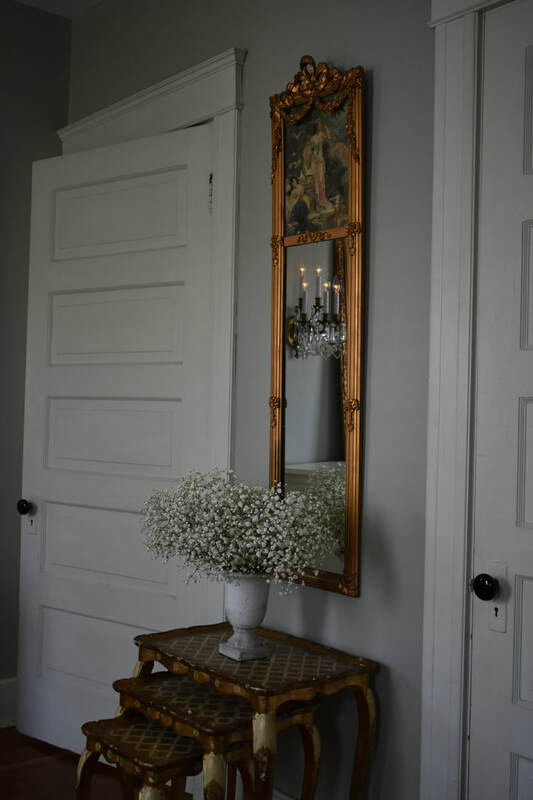 Pretty on its own, reflected in an ornate mirror, this vignette sings. Photo/Design: Corner French Cottage. House tour of a charming French cottage…certainly lovely indeed! Shabby chic,. French cottage decor ideas and vintage style to inspire your own decor dreams. Magical touches for maximum holiday joy. Photo/Design: Corner French Cottage. French Country Christmas Decorating Inspiration. Romantic Provence inspired interiors with elegant shabby chic charm. House tour of a charming French cottage…certainly lovely indeed! Holiday decor ideas and vintage style to inspire your own decking of the halls. 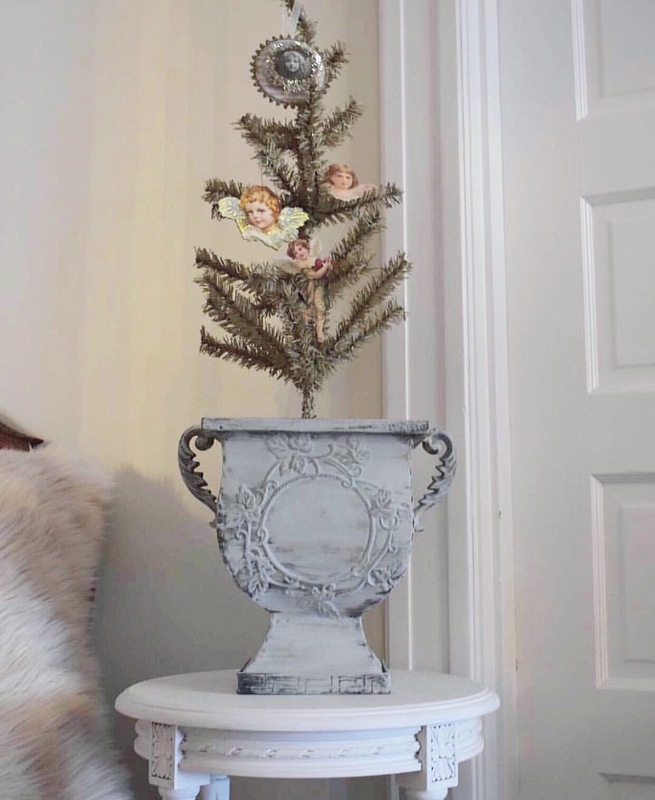 Love how Nichole decorated this tabletop tree! White on white decor can be so striking when done right. Photo/Design: Corner French Cottage. French Country Christmas Decorating Inspiration. Romantic Provence inspired interiors with elegant shabby chic charm. House tour of a charming French cottage…certainly lovely indeed! Holiday decor ideas and vintage style to inspire your own decking of the halls. 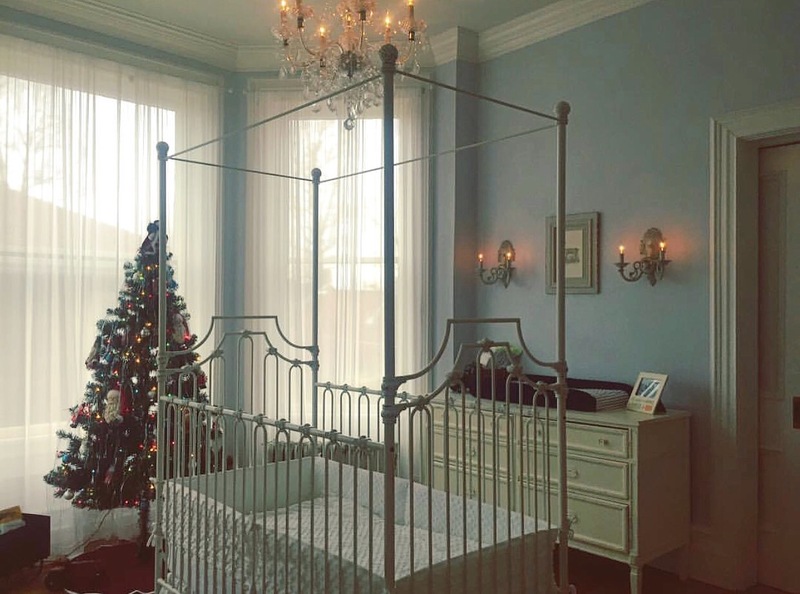 Elegant nursery decorated for Christmas with its own mini tree. Photo/Design: Corner French Cottage. French Country Christmas Decorating Inspiration. Romantic Provence inspired interiors with elegant shabby chic charm. House tour of a charming French cottage…certainly lovely indeed! Holiday decor ideas and vintage style to inspire your own decking of the halls. Here’s a lovely SCONCE OPTION. Romantic, white, and Frenchie perfect. Photo/Design: Corner French Cottage. House tour of a charming French cottage…certainly lovely indeed! Shabby chic, French cottage decor ideas and vintage style to inspire your own decor dreams. I’m dreaming of a white Christmas. Pin me! 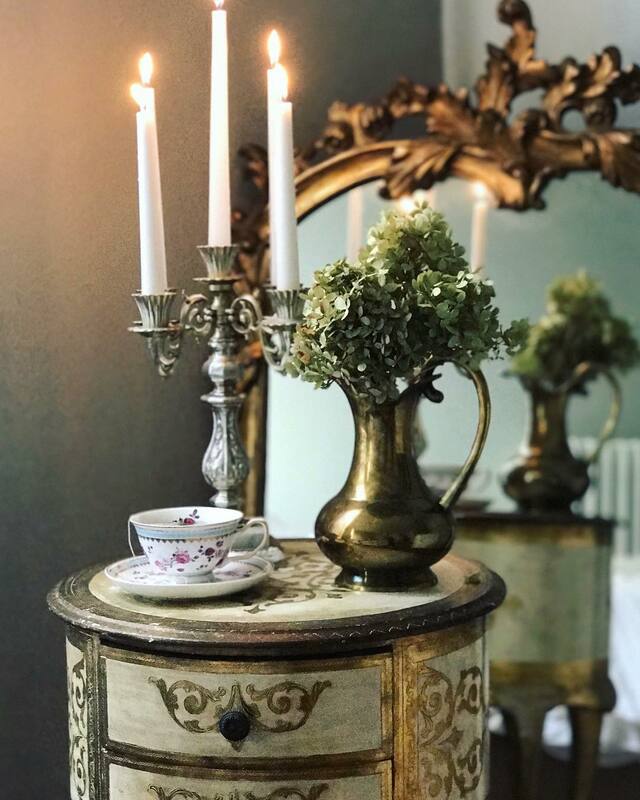 Thank you so much, Nichole, for sharing the beauty of your enchanting home. WHAT A TREAT THE SNOW HAS ALREADY BEEN FALLING HERE…have you seen any white stuff in your neck of the woods? Do visit my PINTEREST BOARDS and PIN pretty things to spread the magic – I am saving Christmas decorating ideas at the moment! Nora Murphy Country Style to Inspire! So many pretty photos. Dec. 6 is kind of the official start of Christmas season here. It’s St. Nicolas day, when children receive little presents. It’s hard to find live Christmas trees before that, though I noticed that my town, Carcassonne, as well as Toulouse and Montpellier already have lights strung in the streets, but not turned on. I love this post and the simple house that she has chosen to love. I’ve always thought that it’s not the mega mansion I would chose to live in but an old house with a little character to love on and the things in it would bring the house to life. Add and old fashioned kitchen with a fireplace to sit by and I would be in happy. Beautiful, serene pictures this morning, Michelle. I love her subtle nod to the Christmas season. I, too, find the Christmas season is being rushed. Decorations and music in stores in October? I’m afraid it’s all about the buy, buy, buy more stuff mentality. I like the quote, “ It’s not what’s under the tree but who’s around it”. Yes – always rushed and oversaturated even when the madness debuts in October! It’s a keeper for sure. I’m really loving the white on white with green color scheme this year. This is my plan for Christmas 2018. Thanks for such lovely inspiration photos. 🙂 Lovely as always.